Press cartoonists say they are dodging “moving red lines” in the run-up to a June 14 presidential election in Iran, a country where a satirical image can get a newspaper banned or an editor jailed. There have always been no-go areas, such as caricaturing the Islamic Republic’s supreme leader, Ayatollah Ali Khamenei, or the military, but there has still been a certain freedom of tone during the campaign. Two leading cartoonists, working at reformist newspapers, told AFP their job remains fraught with difficulty as the restrictions have not been clearly defined. Several others from across the political spectrum declined to be interviewed by AFP about their election coverage. Jamal Rahmati, 40, artistic director of reformist newspaper Etemad, told AFP that, “in general, before the elections we get relative freedom, to a surprising degree. We can touch on every topic except clerics. “Nowadays, there may be a problem with any topic because the boundaries are not clearly defined,” he added. Some things are obvious, and the culture ministry, which supervises the media, warned the press in July against publishing certain reports about the impact of Western sanctions that plunged Iran into a deep crisis. 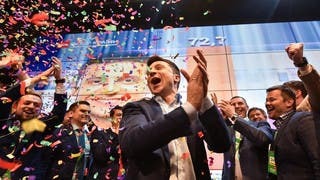 The European Union and the United States have both imposed unilateral sanctions against Iran’s oil and banking sectors to punish its refusal to suspend uranium enrichment and the resulting loss of hard currency receipts has sent the value of the rial into a nosedive and the inflation rate soaring. Another sensitive issue is Iran’s support for Syrian President Bashar al-Assad in his efforts to crush a 26-month-old uprising. And, of course, there is the election itself, in which all eight candidates received the approval of a conservative-led regime vetting body to stand. After Mahmoud Ahmadinejad was re-elected to his second term in 2009, it was widely believed that his victory was due to electoral fraud. That sparked a public outcry and massive street demonstrations that the regime crushed with deadly force. Hadi Heidari, 33, who directs art work at the oft-banned reformist daily Shargh, echoed his colleague. “Officially, we must work within the framework of the rights outlined in the constitution, with the exception of the supreme leader Ayatollah Ali Khamenei and the armed forces,” said Heidari. As an example, Rahmati cites the seemingly innocuous matter of a hike in poultry prices, saying he would have never thought that drawing a chicken would be a red line. For reformist newspapers, Ahmadinejad, who is barred by the constitution from running for a third consecutive term, has also become a red line. 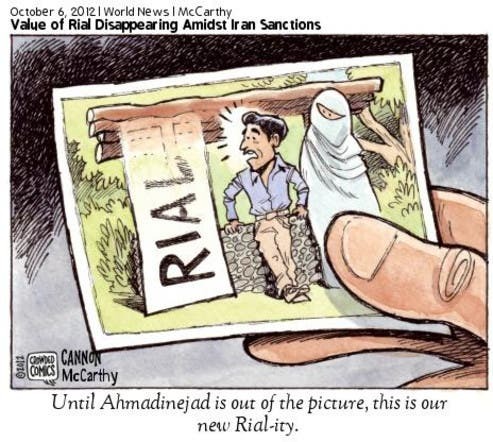 Heidari said that while he was able to caricature Ahmadinejad in 2009, he can’t now. In late April, Ayatollah Khamenei outlined his vision of how the media ought to conduct itself during the election campaign. The media should “encourage people to choose correctly, criticize in a logical manner and not publish just anything,” he said. To protect themselves from the wrath of the censor or prosecutor, the newspapers have hired “advisers,” who effectively help them to carry out self-censorship. Heidari acknowledges that he often decides against submitting certain drawings. “Self-censorship is a disease, but we have to live with it,” he lamented. One of his drawings, entitled “Blindfolded,” was considered an insult to the veterans of the Iran-Iraq war and led to the closure of the newspaper last September. “In Iran, due to the current economic and political situation, the cartoonist must rely on symbolism instead of realism. So the drawing becomes more influential because it paves ways to multiple interpretations,” Heidari explained. During a debate among the presidential candidates on Wednesday, which focused on cultural matters, the matter of dealing with the press was raised, and distinct views emerged. Mohammad Reza Aref, the sole reformist candidate, and moderate cleric Hassan Rowhani, criticized the broad restrictions imposed on the press in the Islamic republic, and called for more freedom. “They ban newspapers, prevent books from being published or ban a film. These are things that must be corrected,” Aref said. But frontrunner Saeed Jalili, a conservative candidate who represents Iran in its nuclear negotiations with world powers, dismissed the charge of a lack of press freedom. “Just because two newspapers belonging to a political movement are shut down, we cannot say that there is no freedom,” said Jalili, alluding to the closure of reformist papers in recent years. For Iran’s political cartoonists, none of this is a laughing matter. The US-based Committee to Protect Journalists said earlier this year that Iran was the fourth most-censored country in the world and that, at the beginning of December, 45 journalists were behind bars.